Versus Versace has tapped Grammy-award winning artist M.I.A. 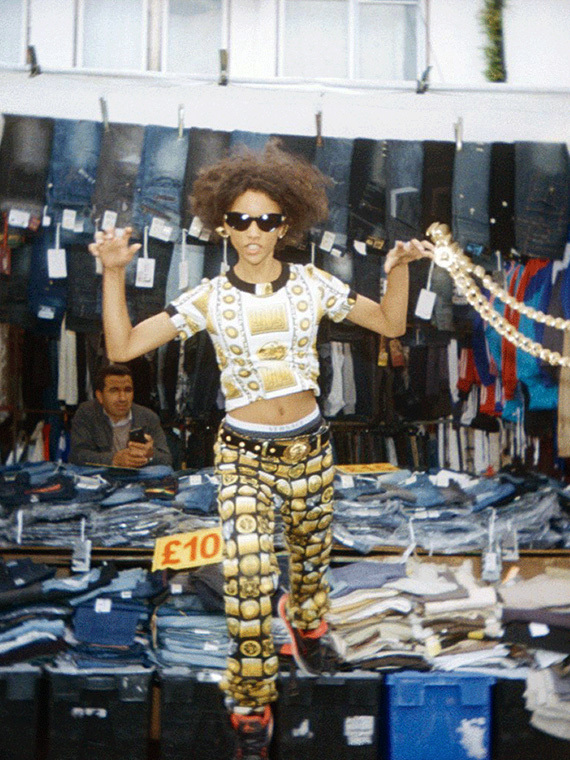 to launch a 19-piece capsule collection inspired by the bootleg Versace merchandise she found in London markets as a teenager. The collection for both men and women features kaleidoscopic prints mishmashed with famous Versace emblems, from the Versace logo to the interlocking Greek key on T-shirts, printed jeans, silk shirts, jersey dresses and military-inspired outerwear. The capsule collection is the latest collaboration for the new Versus Versace, which lives online for the digital generation. The launch will be accompanied by a digital GIF campaign featuring images of M.I.A. and friends wearing the collection on East London markets, shot by Mexican photographer Jaime Martinez. M.I.A. x Versus Versace will be available online and in select stores and http://www.versusversace.com on October 16th. “It’s always been part of the M.I.A. culture – to talk about bootlegs, and people that sell them or make them. When I was approached by Versace, it seemed like a good idea to take that and reverse the cycle. Versace designs have always been bootlegged, now it’s Versace bootlegging the bootleg for the bootleggers to bootleg the bootleg. This is to keep that cycle going.” M.I.A., whose new album Matangi is released November 5. Next PostNext Minju Kim’s H&M Collaboration Hits Stores Today!